A sugar cookie made with a mix of light and brown sugar. Stir flour, baking soda, cream of tartar and salt together in a bowl; set aside. Cream the butter, sugar, brown sugar and vanilla together in a mixing bowl using high speed of an electric mixer. Add the egg and beat for about 30 seconds, then add the flour mixture and stir by hand until it is mixed in. Roll the dough into 36 little balls and coat tops with sugar. Arrange about 2 ½ inches apart on parchment lined cookie sheet and bake 12-13 minutes or until edges are nicely brown and tops appear crackly and set. Thanks for letting me know, Jennifer! I need to make these again too so I can update the photo. I make a lot of cookies at Christmas time to give out as gifts. These made the list this year and out of everything I made these were my favorites! I am a sugar cookie lover anyway, but for some reason these just really did it for me. I’ll be curious to see how they go over with family and friends when I make up my cookies tins and trays this year. I will definitely make these again. Super easy and really yummy! Louis, did you weigh the flour? If you weighed the flour and used the same weigh as ATK, then it wouldn’t have been an issue. But if you measured by volume, your cup of flour could have held less than theirs and you might have (no fault of your own) used too little flour. I’ve found that when my cookies come out too thin it’s because I didn’t use the same amount of flour as the recipe developer (remember, 1 cup of flour can weigh from 3.8 oz to almost 6!). Sometimes cookies spread because the butter is too soft or reasons involving the cookie sheet (too warm, too thin). but I think in most cases, it’s just discrepanices in flour amounts and I’m glad more people are using scales to measure rather than just volume. This brings me to one last thing that *might* have caused spreading. If I use to much sugar, cookies spread. Since the ATK recipe calls for brown sugar, maybe you packed yours into the cup more than they did and used a higher percentage of sugar? Just a though. I still think it was the flour. I made these cookies last weekend and they were wonderful. I took some of them to a cub scout camping trip and they got RAVE reviews. I cut back the sugar some (1/4 c. less). With the turbinado sugar on top, I think I could cut it back even further and they’d still be super. I agree with Suzy, the CI brown sugar cookies are absolutely delicious. I’ve made them twice already and actually liked them better when baked after the dough had spent the night in the refrig (like a lot of cookies). Those cookies look unbelievable! Exactly what I’m craving with my coffee with morning. I hope your eye is feeling better. Also try the Arnica oral tablets. You can take them and use the cream together to speed up the recovery process even more. Take Care! Thanks for the sympathy! I think the arnica is really working. Now it’s Friday. I’m going to try to stay out of trouble. I liked Janet’s spa suggestion so I think I’ll check into Barton Creek Resort today. Gluthlu, thanks for the thorough review! I hope that answers J’s questions about texture. Mine came out exactly the same as yours. I can’t help but wonder how these would be with a little more flour. I used 9 oz (2 cups), but some people’s 2 cups is actually 10 oz, so the original version *may* have used more flour. That is, a heavier-handed 2 cups. Suzy, thanks for reminding me about the CI recipe. I have it in my files and will try it. Here are their measurements. They use more flour, less butter, more sugar, extra egg yolk, different leaveners and the technique is typical CI with some tricks thrown in. These look just like the Brown Sugar Cookies from Cook’s Illustrated. I saw them make them on TV and had to try them out. The difference is that they brown the butter first. It’s one of the best cookies I’ve ever had! You might try those and see if you like them too. I just made these cookies – for me they came out very thin, crunchy around the edges and chewy in the middle. 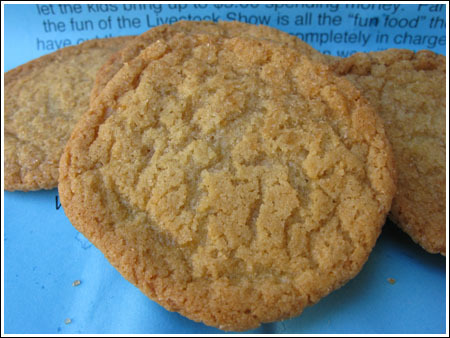 The brown sugar and vanilla make their flavor reminiscent of a chocolate chip cookie sans chips. Delicious! Sorry to hear about that! It’s good thing you had frozen rhubarb for rescue. Thanks for posting the recipe. I put my back out a few years ago unplugging the vacuum cleaner! “that’ll teach you to try something new,” my husband said! He’s a funny one! What a morning, but I love how well you handled it. Way to go girl…& YAY for the yummy cookies! Ouch! I hate those kind of days. After those kinds of days I really enjoy snuggling up in bed and collasping. Never heard of arnica but will definitely check it out at the drugstore. Ouch, you have had a morning! Hope the rest of your day went better. This recipe looks really good…I think I am going to have to get a bigger area for “Anna’s recipes to try”;-) Thanks! Take care of yourself. You poor thing! I love arnica – discovered it through my dance instructor years ago and can’t imagine life without it. At least your cookies are gorgeous, that would have been the last straw. I wonder how many funny looks you received en route to the store with a bag of rhubarb pressed against your face. Stop cleaning, keep cooking….These look simple and simply delicious! That was quite a morning you had! I’m glad at least the cookies turned out good, so you can eat them and fell a bit better! Hope your eye doen’t turn blue, but if does you should totaly post a picture with the title: See what happens when you do housework instead of baking! Take care! Ack! You’re definitely having one of ‘those’ weeks. Tomorrow you’ll be able to say TGIF, and really mean it! You should never clean again! Stupid broom. I hate it when things like that happen, it makes me want to throw a bit of a temper tantrum. But, I feel like these cookies might have some major healing powers. They look delicious! You have had a he**ofa week! Time for a weekend at the spa. The cookies look great but you need some Anna time! You poor thing! I’m glad you got the arnica. About these beautiful cookies: What is the texture? I gave up cleaning for Lent about 20 years ago and never took it up again. And, I’m Jewish. Yikes – I’ve never had lemon in the eye, but I have had chile pepper in my eye on more than one occasion. Yep, that sounds like something I would do! Glad you had the rhubarb on hand! Do these taste like brown sugar sugar cookies? They look great! Wow! Never heard of the gel, but I’ll have to look for it. Another reason to avoid housework — it can be down right dangerous. Oh my gosh, you poor thing! Be careful! 🙂 Also, I would kill for one fo those cookies RIGHT NOW. These look so YUM! Good to know about the gel! Hope you aren’t too sore! Yum to the cookies! Yuck to the kapow to the eye! Hope you can keep the healing going! Be careful. I totally agree, housework-thumbs down, baking-two thumbs way up! Take care. What a morning! I hope you are ok!! The cookies look great, never had brown sugar cookies before. I am sure I will love them!